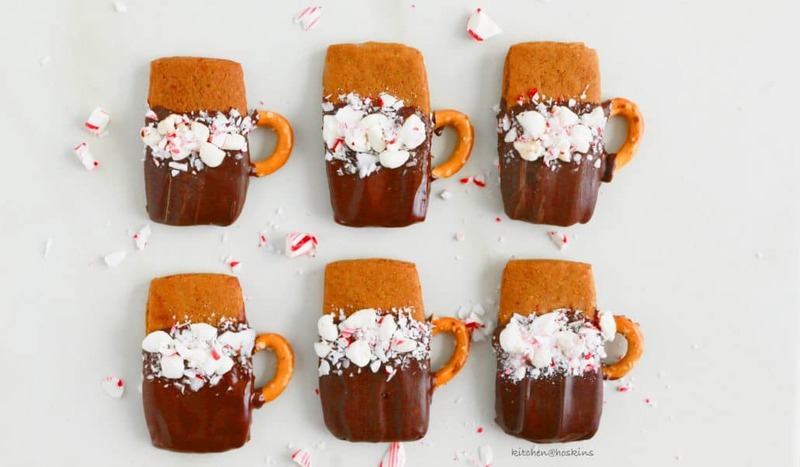 Cute, adorable, fun gingerbread cookie cocoa cup. Your kids will adore these unique gingerbread cookies. How about a creative gingerbread cookie this year? A cookie or a cup? 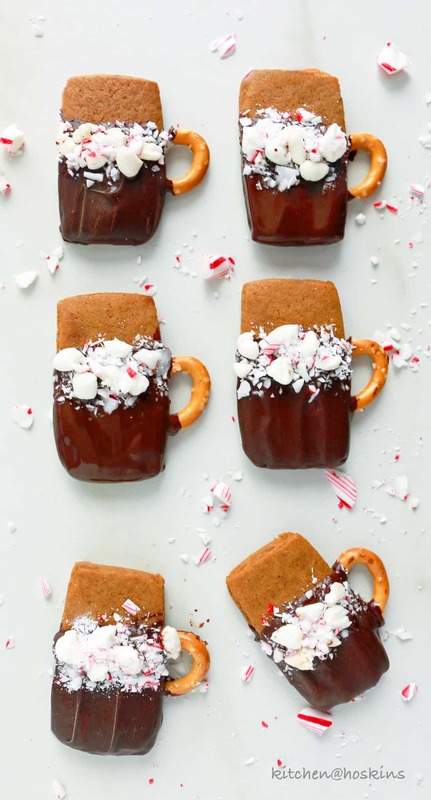 Your kids and your neighbors will adore these gingerbread cookie cocoa cup. CUTE, adorable and so fun! I’ve been using Sallys Baking Addiction gingerbread cookie recipe since she shared it in her blog. 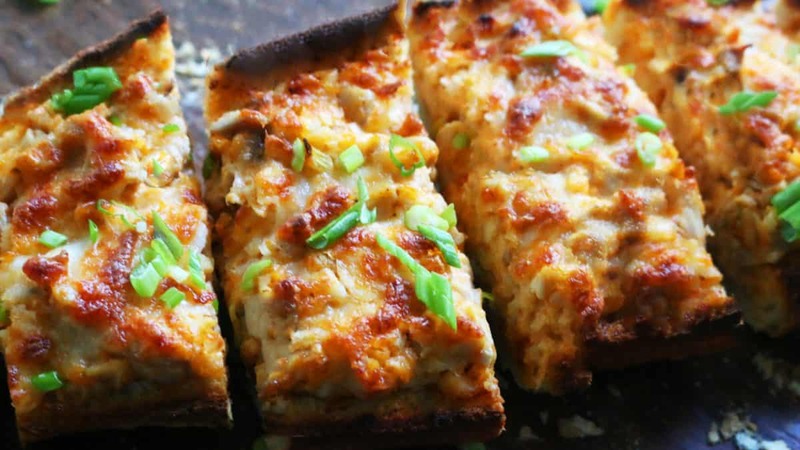 Can’t go wrong with cookie queen’s recipe right? 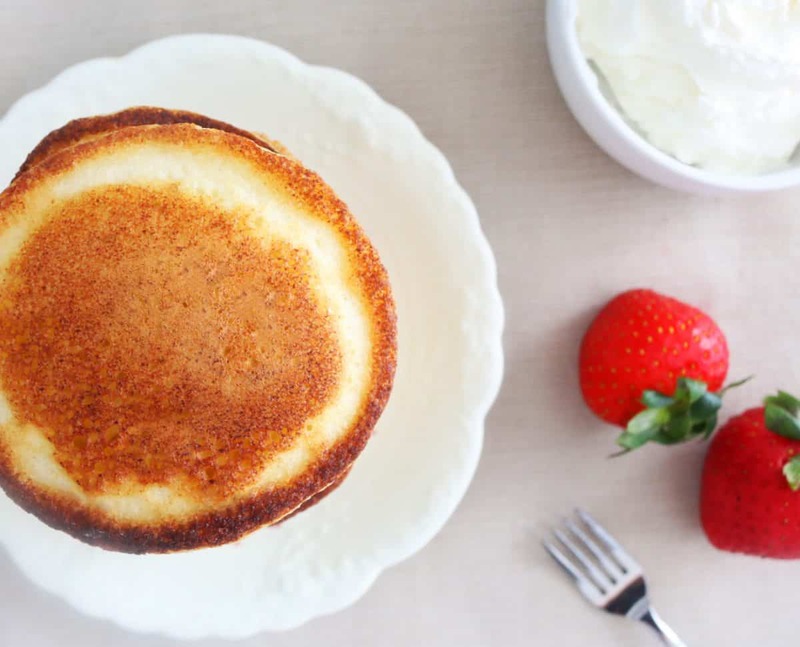 You could totally use your favorite recipe. Cut 2-inch by 1-inch rectangles from the gingerbread cookie dough and bake as per instructions and let cool completely. This step can be made several days ahead. 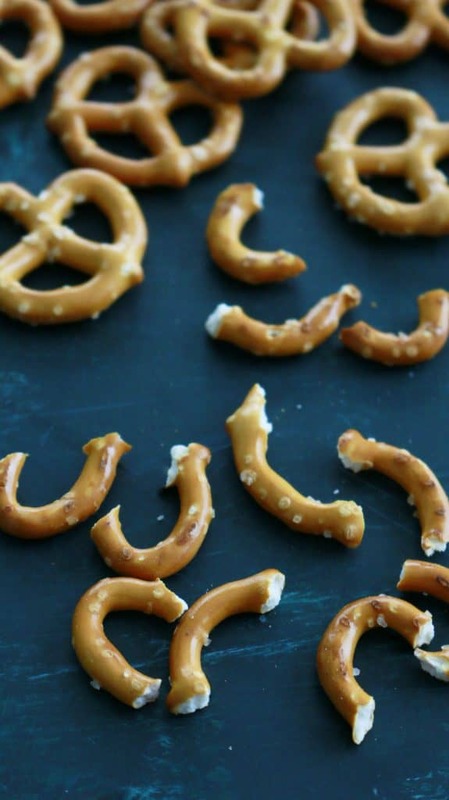 Break pretzels into a curved piece to get handles. I was able to get only one handle from each pretzel, 2 occasionally. Cut each mini marshmallow into 4 pieces with scissors. Melt semi sweet chocolate chips and vegetable oil in the microwave. Using a spoon spread melted chocolate on about 2/3rd cookie (I coated only the front side). Step-2 in the picture below. Place cookie on parchment lined sheet. 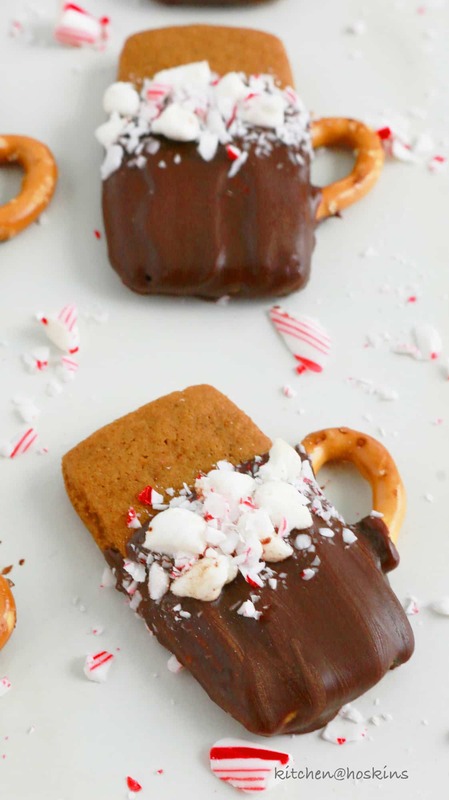 Dip both ends of the pretzel handle in melted chocolate and stick to the cocoa cup. 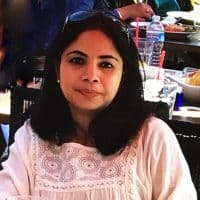 Step-3 in the picture below. Place 2-4 pieces of marshmalows on the top end of melted chocoalte to resemble marchmallows floating on hot chocolate. Step-4 in the picture below. Sprinkle crushed candy canes on top of marshmallows. Using a small paint brush and tooth pick to remove excess candy canes and to make the cookie look neat. Since these rectangles are tiny, I used a portion of the gingerbread dough to cut as many rectangles as I needed and cut gingerbread men (what else?) with the remaining dough <— two cookies with one dough. There are no real measurements here. 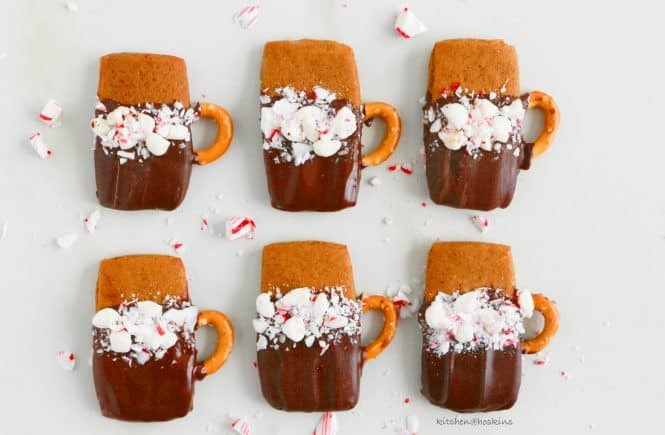 Melted chocolate, pretzels, candy canes and marshmallows are needed based on as many cookie as you are decorating. 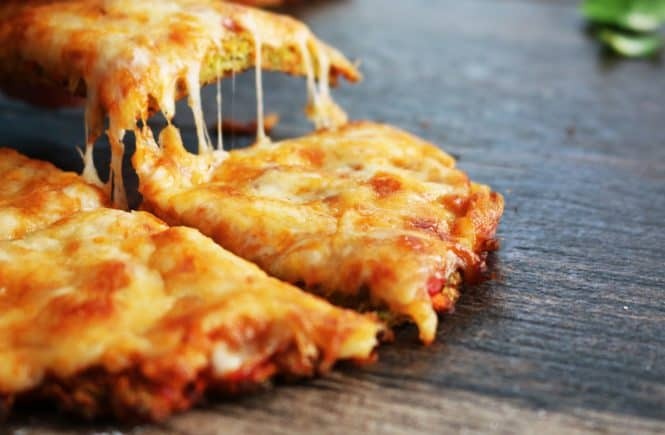 The recipe below is just a guideline. It varies on the number of cookies you are decorating. 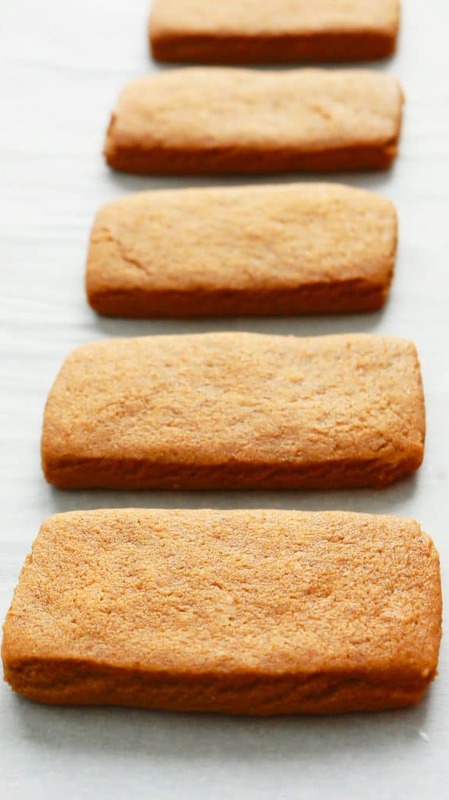 Prepare gingerbread dough as per your favorite recipe, cut into 2-inch by 1-inch rectangles. Bake as instructed (I baked for 8 minutes to get a slightly crispy cookie). You could bake for lesser time to get a softer cookie. Cool completely. Break pretzels carefully to obtain handles. (I was able to break only one handle from each pretzel. Two, when I got lucky). Using a scissors, cut marshamllows into 4 pieces each. Place candy cane in a ziplock bag and crush with a rolling pin, until almost fine. Transfer to a small bowl. Melt chocolate chips and oil in the microwave until completely melted ( 60 to 90 seconds). Stir every 25 seconds. Using a spoon, spread melted chocolate on a cookie, covering about 2/3rd of it (refer picture). Smooth edges to remove any excess ( I covered only the front side). Place cookie on the prepared baking tray. Dip both ends of a pretzel handle and stick to a side (refer pictures). 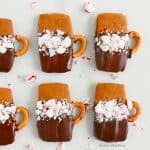 Place a few cut marshmallows (to resemble floating marshmallows in hot cocoa) and then (using your fingertips) sprinkle crushed candy canes on the top of marshmallows (do not cover the marshmallows). You can use the small brush to remove any excess candy canes on the cookie (to make it look neat) and the tooth pick to remove from the chocolate. Repeat process with every cookie. Let cookies set at room temperature for several hours until chocolate has hardened. Store cookies at room temperature in a air tight container for up to 2 days. I used Sally's favorite gingerbread cookie recipe. 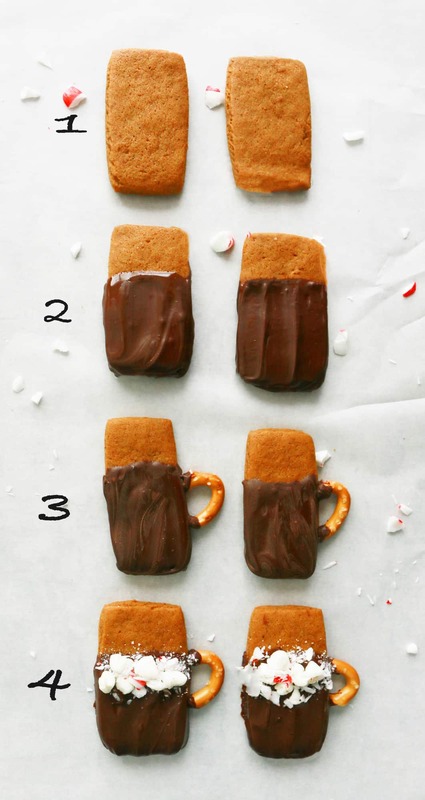 You could totally use yours or make these from scraps after making gingerbread men / gingerbread house. These are totally ADORABLE!!! Plus a fun thing to do with the kids 🙂 so festive! Love it Maria!! These are ADORABLE!! And you’re right, you really can’t go wrong with any of Sally’s cookie recipes. She never fails!! Those are the cutest Maria!! LOVE!! I love your creativity Maria!! These are so cute and adorable! Love them!